« CURSE THE GODS OF SUMMER II – First 12 Bands Announced! Earlier this year, House of Dolls asked their fans to help them make a record through a :fund:it campaign. Showing the DIY spirit is alive and well (with a little help from investors – Ed.) the band have finally completed and released their debut album, ‘Welcome To The Department of Nuclear Medicine’. Twelve songs that delve into the band’s defining melancholic, alt-rock core and further explores that infectious psychedelic sound first heard on ‘Gimmie Some Glory’ and ‘Before She Wakes’. Opening with the full throttle ‘I Thought You Were My Friend’ and ‘Murder Machine’, the record refuses to pull it’s punches and sets you up for the ambient and wonderful ‘Photograph’ (sadly not a cover of the Def Leppard classic….next time – Ed. ), ‘Prostitutes’ ups the tempo with its chunky guitars and vintage punk influence before the stellar ‘Into The Void’ shines through. Set on a basic bass line, Into the Void is wrapped it in both vastness and heavy, spiralling, soring leads and bewitching vocals. An excellent song if ever there was one. Despite sticking closely to their formula sound, the band are able to diverse themselves into several different forms of attack. On heavier / rocking numbers such as ‘Light Starts to Fade’, ‘No Excuses’, ‘Ills’ and ‘American Dream’ House of Dolls put both feet forward, pounding you with guitars and solid vocals while the more radio friendly numbers like ‘Lovers & Clowns’, ‘Photograph’, ‘Into The Void’, and ‘All I Need’ maintain the same gritty overtone, but stay neatly wrapped in a polished, well thought out collision of instrumental leads and un-intruding vocals. An excellent album from start to finish and one well worth buying if you’re looking for some new blood on the scene. 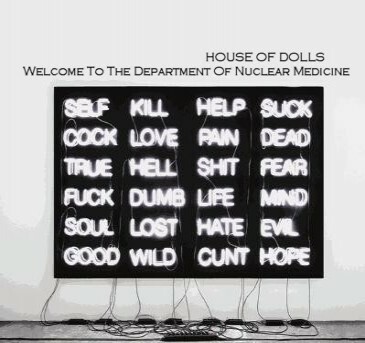 This entry was posted on June 7, 2012 at 12:30 pm and is filed under Album Review, IRISH NOISE!, Music with tags Gimmie Some Glory, House of Dolls, Into the Void, Review, Welcome To The Department Of Nuclear Medicine. You can follow any responses to this entry through the RSS 2.0 feed. You can leave a response, or trackback from your own site.